News Kontent: Gold is still the go, no doubt about it.. It is our contention that this breakout is the real deal and the pathetic action of the US Dollar Index supports our view. Rather than rally, the American currency has embarked on another southbound journey and this is extremely bullish for gold. Furthermore, the recent zoom in silver and the precious metals mining stocks is additional evidence that this breakout is not a head fake. Figure 1 highlights the recent breakout in gold. As you will observe, gold's bull-market has been punctuated by lengthy consolidations and this is the third time gold has broken out towards the end of the third calendar quarter. 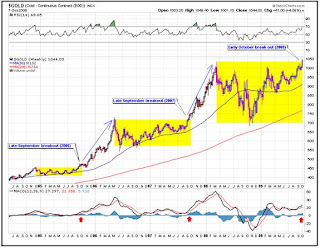 On the 5-year weekly chart for gold we can see that everything is now in place for a MAJOR RALLY in gold to commence. It has managed to hold the high ground for weeks following its upside breakout from a Triangle, and is repeatedly pushing at the resistance approaching its highs. Yesterday's action was strongly bullish. With all moving averages in bullish alignment, THIS RESISTANCE IS ABOUT TO FALL.